Area 2 Deep water Halibut fishing has now come and gone but, not without a lot of excitement and some rather challenging sea conditions. As you could tell from my report last week we were able to get out and get our fish and they were nice ones at that. Halibut retention continues in the local area but you really need to study the regulations on where to fish. In a nut shell you must be north of Grays Harbor and in no deeper than 180 feet of water. 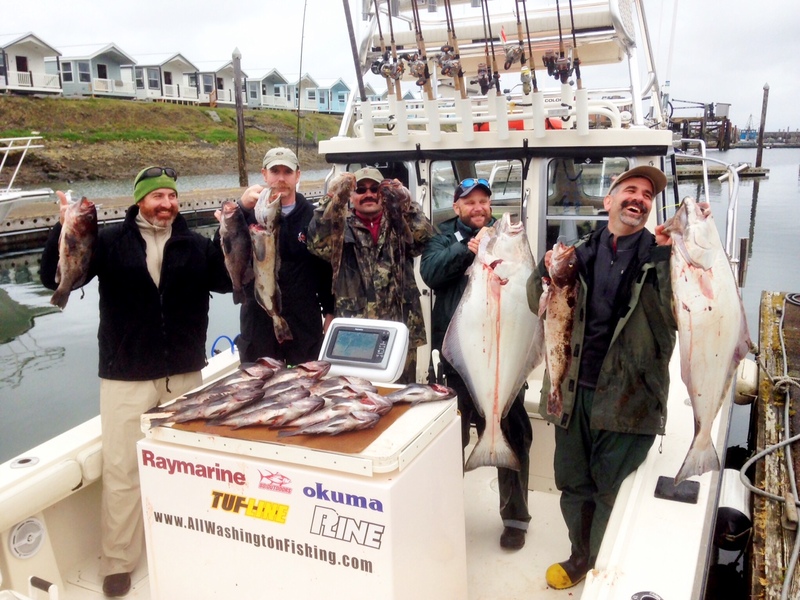 There is approximately 3000 pounds of fish remaining in our Halibut quota. When it is gone we are done for yet another year. 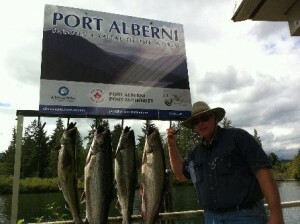 We have a couple of weeks before the big day arrives on May 30th and the opener of Salmon fishing. I am hearing reports from the Commercial Troll fleet that the fish are moving down into the Westport/Grayland area so it should make for a good opener. I would plan to start my search along the shore north or south of the jetties. Silver Horde 3.5 inch Kingfishers spoons and Coho Killers should be the lures choice fished behind a QCove Polar Orange or Killer Crush Flashers. For fishing behind a Diver, I’d run a straight spoon or anchovies. I am speaking Wednesday May 20th, 6:00pm, at the South King County PSA meeting on the early Chinook fishery in Westport. This meeting is held at the IBEW Hall in Kent. 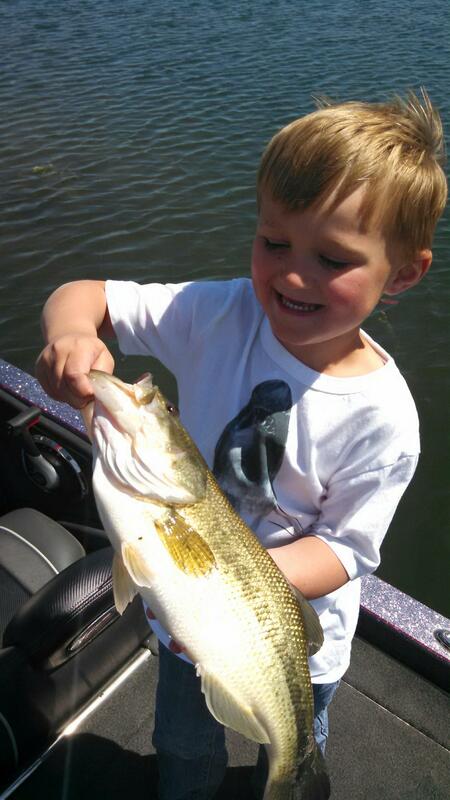 Bottom fishing continues to be a blast and is a great way to spend your day before or after your big fishing trip. 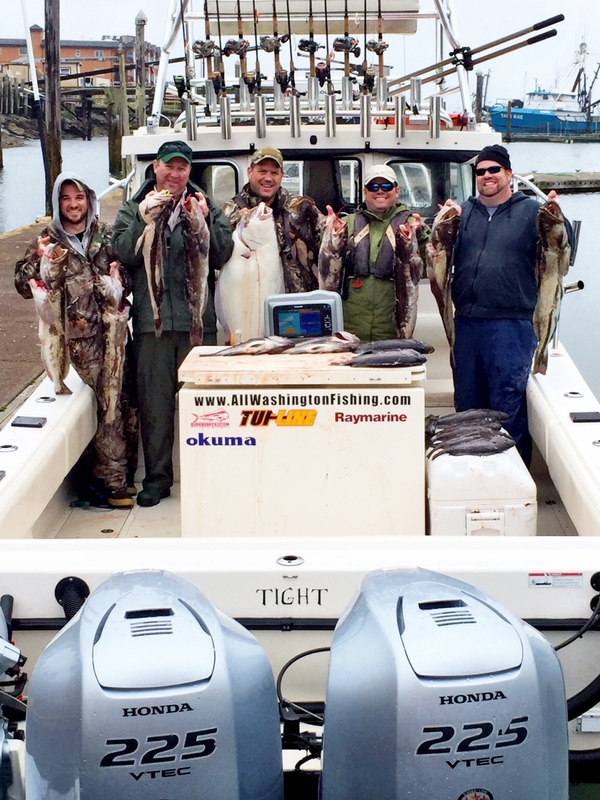 All Charters offices offer these trips. 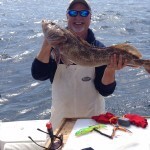 Hey make your plans to come to Westport and experience some really Great fishing soon. Have Fun, Be Safe and, I’ll see you in Westport! 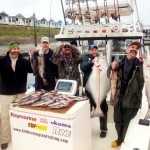 Tuesdays final haul but the inshore halibut season remained open and our team took advantage of it. 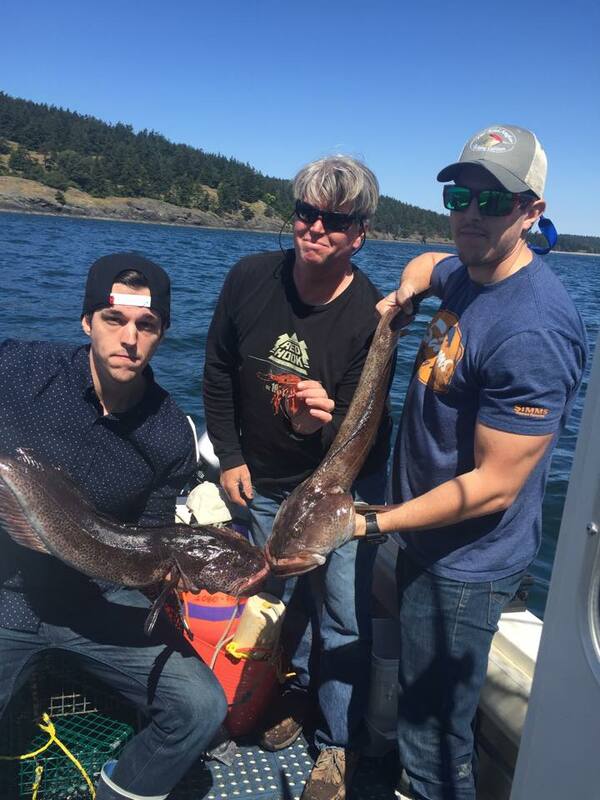 Over the weekend our Express Charter boats Reel Tight and Elite harvested 4 bonus inshore Halibut as well boat limits of Lingcod and Rockfish. Herring and mooching weight was the ticket for the Lings and halibut and the rockfish were taken on your typical shrimp fly setup. We’re looking at another two months of bottom fishing but the best of it will be from now through mid July. BUT starting March 30th the marine area 2 chinook season will kickoff. This fishery out of Westport will be a TWO hatchery chinook per person bag and if wanted we can combo for bottomfish. ***10% for any trips booked mentioning Salmon University from May 30th through June 12th! 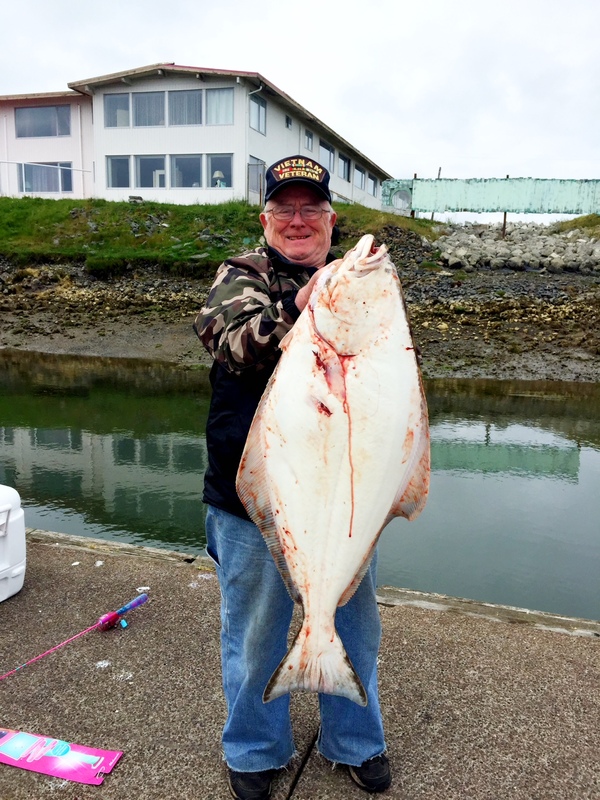 Halibut fishing continues to be pretty productive in the Islands. Most success is coming from anchoring up. Prawns rock on, and Ling is the thing. Tides look much better for all three next weekend. Karen Rhinehart with a perfect size slot limit Ling. Area 11 is closed to salmon fishing until June 1, 2015. The salmon fishing has picked up a bit in Area 13. Pt. Gibson on the outgoing tide mooching, jigging and trolling all seem to be working with salmon ranging from 5lbs. to 18 lbs. Also the Green Pt. 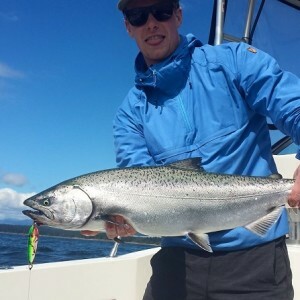 / Sand spit area is producing some salmon as well mostly trolling in this area and a little inconsistent. can only fish in 120’ of water or less and release any rockfish carefully their survival is very important. The new marina hours are 5:30 am to 8:30 pm. Basic Fishing Classes Offered at Point Defiance Marina Monthly classes are offered to youth and adults to prepare you to better take advantage of the fishing at Point Defiance and the local lakes and rivers. Learn knot tying, tackle, rods and reels, rigging techniques, regulations, and safety. 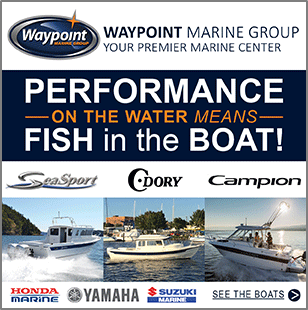 75% off Boat and Motor Rentals. ($25 PER DAY ) No WA STATE DEPT FISH AND WILDLIFE LICENSE REQUIRED THIS WEEKEND. First weekend we are open for salmon fishing in Area 11. For More information call 253 -591-5325. Limited to boats and motors on hand. 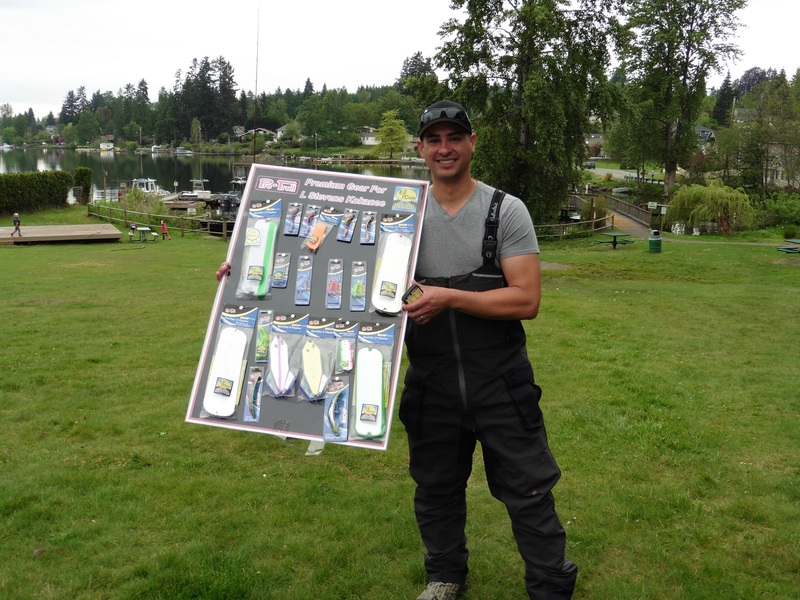 The 6th Annual Lake Stevens Kokanee Derby was held on Saturday May 16 and about 190 adult anglers and 50 kids participated in this awesome event! 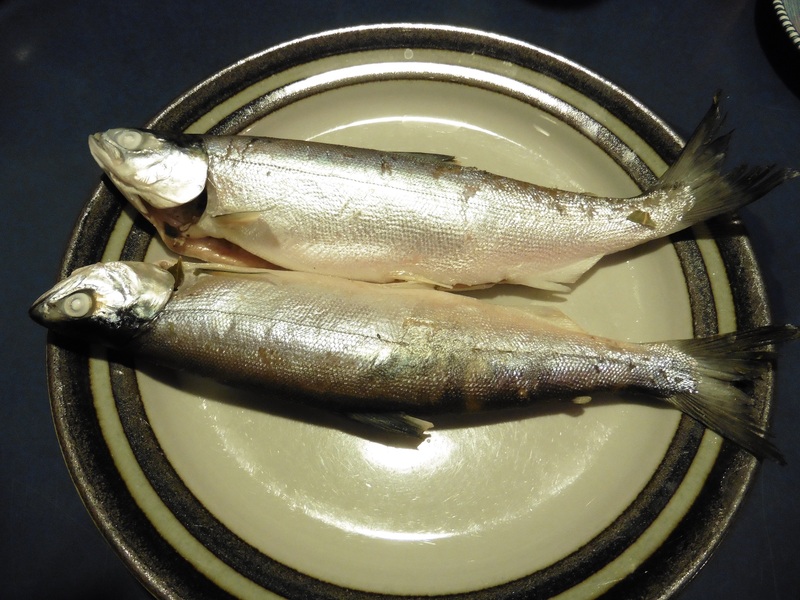 A couple of delicious Kokanee from the Derby! For the last several months, kokanee fishing has been really great on Lake Stevens. This has been primarily due to the warmer weather this year. The great “catching trend” continued on Saturday with a very high percentage of anglers turning in their 10 fish bag limits. One boat even turned in 6 bag limits! So while they were much more numerous this year, they tended to be smaller than past years, but are just as tasty! 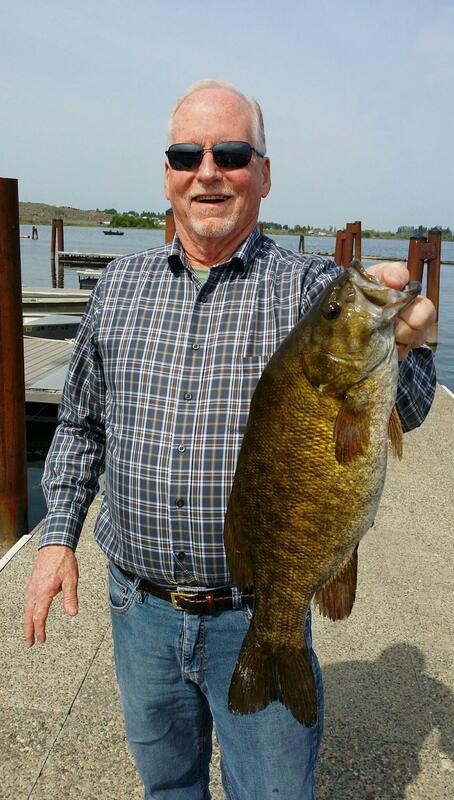 Lake Stevens is a great place to fish. It has excellent ramps and a two-pole endorsement is allowed. Due to it’s sheltered location nestled in the surrounding hills; many anglers with very small boats are able to safely fish this lake. 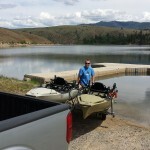 Additionally, the lake is planted heavily with both kokanee and trout each year. 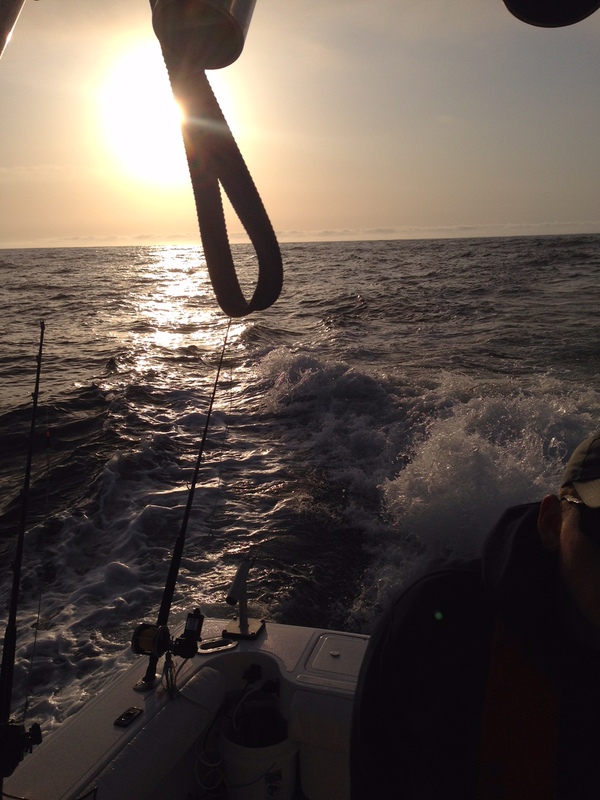 Fishing started before daybreak and was very good in the early hours. By 10:00 am, some anglers were already coming in with their bag limits. They all wanted to be first in line when the weigh station opened! The weather was overcast for most of the day with a steady breeze blowing. That kept the bite going all day and many anglers fished right up off 2:00 pm weigh-in/cut-off time. They were all looking for that one big Derby winning fish! The Awards Ceremony was held at 3:00 pm at the weigh-in location which was about 100 yards north of the “City Launch Ramp”. Derby received a prize, whether they caught a fish or not! I believe that this practice will encourage many of them to continue to become adult anglers. Karen Swift won the Adult Division with a Kokanee weighing .86 lbs. 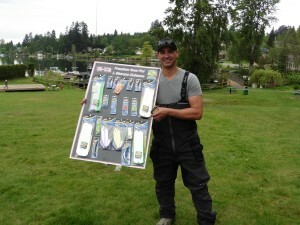 Jody Wise earned the prize for the Biggest Kokanee Limit with a combined weight of 6.6 pounds. There were tons of great prizes due the generosity of the many derby sponsors. A complete list of all the winners can be viewed at http://www.gregscustomrods.com/about/derbies-pg205.htm. If you missed the Derby, it not too late! It is expected that excellent kokanee and trout fishing will continue in Lake Stevens for at least the next several weeks. Plus, put May 21, 2016 on your calendar because that is when the Derby will be held next year! Finally, everyone who participated in this community-based event had a great time. All proceeds raised from the Derby are used to help fund the worthy projects of the Lake Stevens Lions Club and the Snohomish County Sportsman’s Club. Submitted by Mark Gavin, Salmon University staff member and an active member of several Puget Sound Angler Chapters. Walleye Fishing has been really great all week long. Wednesday’s storm slowed the bite down a bit but it is already picking back up. They are catching them trolling a worm harness set up with a slow death hook. Be aware that Potholes Reservoir is near high pool so navigation is readily available to almost any part of the reservoir. 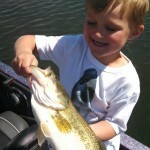 Mason Meseberg shows a 4lb largemouth bass he landed sight fishing with a Sniper Lure. 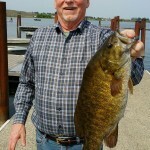 Jeff Dillion caught this nice smallie off the MarDon Dock. 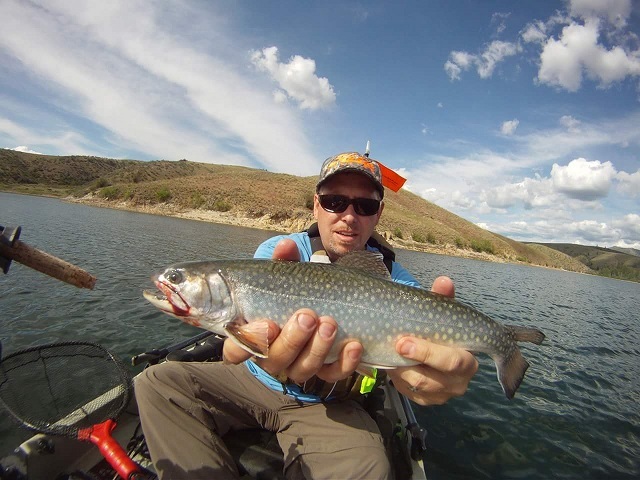 If you’ve ever wanted to catch a big brook trout, then you’re going to have to drive east towards Omak and fish McGinnis Lake. McGinnis is one of many lakes managed by the Colville Indian Tribe. It requires a separate license ($10/day or $40/year) but in my opinion, it’s well worth it. Combustible engines are not permitted so you’ll need a kayak, float tube or a boat with oars (electric motors ok). This is my second trip to McGinnis. Both times we had the place to ourselves. We arrived to see several brook trout rising to grab bugs off the surface. There’s a hatch going on in the lake that keeps them quite plump. If you’re a fly guy, this is the place to bring your inner tube and cruise around the lake. A white fly would have been the ticket to catching fish on the surface. We had no luck trolling spoons up top with our kayaks, so we dropped our small Needlefish spoons down to 25 to 30 feet of water. Over the course of a couple of hours we landed 5 nice sized brook trout. I have to admit, I was for certain these fish were bull trout based on their coloring, but I’ve received confirmation that they are in fact brook trout. Good luck out there! Spring is the best time to take a road trip to fish Omak Lake on the Colville Indian Reservation. 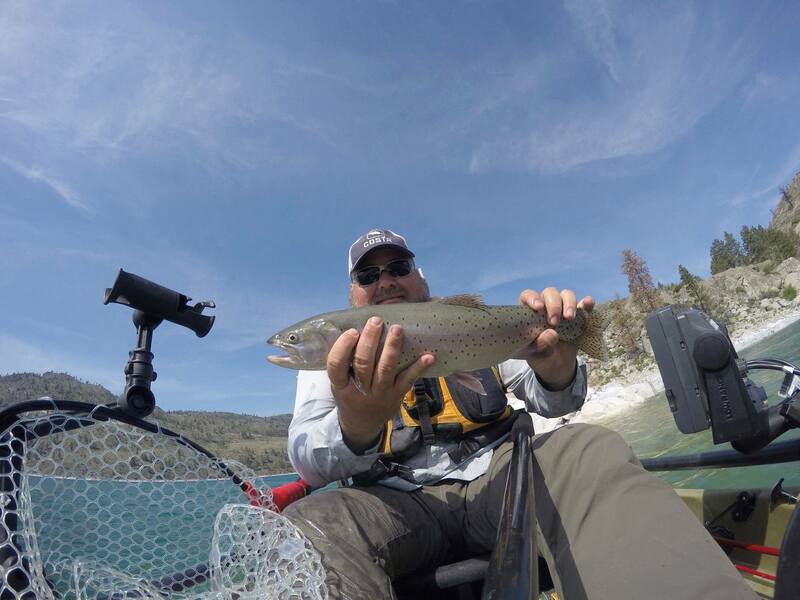 It’s a huge lake that gets stocked with over 100,000 Lahontan Cutthroat Trout every year. The brood stock from Omak Lake are from Pyramid Lake in Nevada. The largest fish caught out of Omak was back in 1993 and tipped the scales at 19 lbs. While we didn’t land any fish of that size, I like to think that there are a few in the teens occupying the lake. 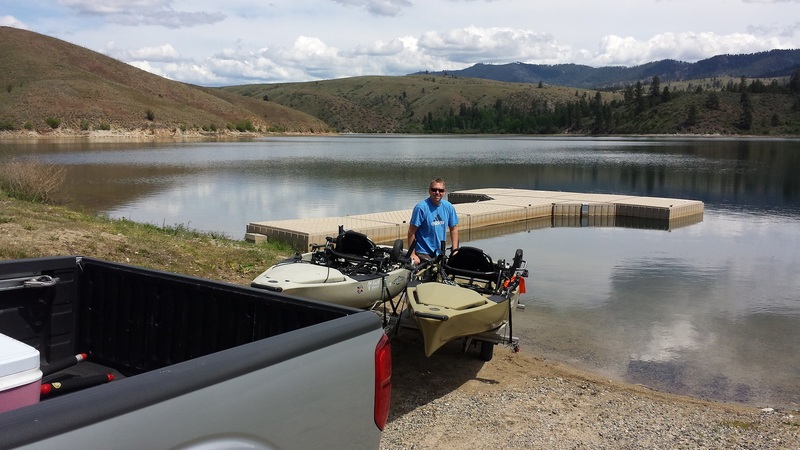 A couple of things to know about Omak Lake. You’re required to purchase a Colville Tribal License which you can pick up at Walmart in Omak. Cost is $10/day or $40 for the year. 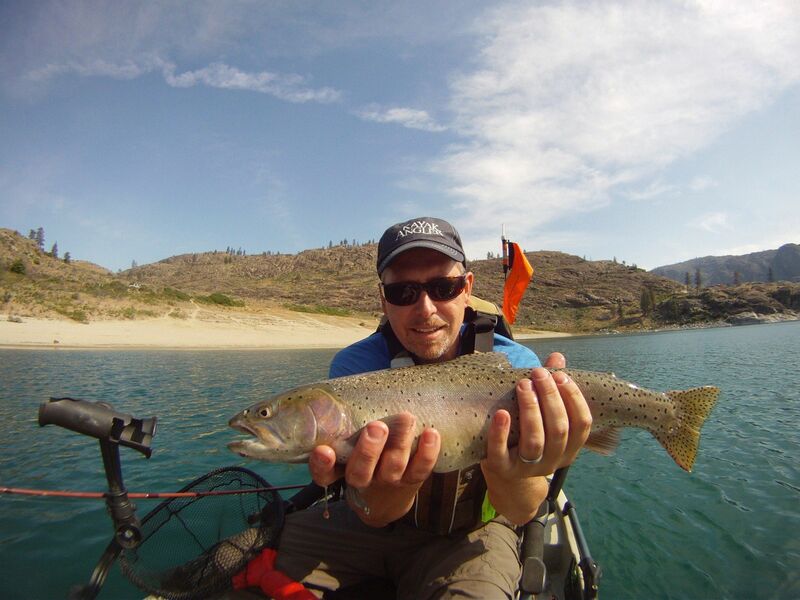 Omak Lake is one of many lakes that you can fish with your special permit. There is a boat launch at the south end of the lake but it’s very primitive and not well maintained. I’ve seen people get stuck and have to be towed out of there. At the north end, there’s a stone and sand beach you could launch a small trailer. It’s an easy launch with a kayak or float tube on either side. Be cautious of the wind. It can be dead calm and by afternoon be blowing 15 to 20mph. Be careful out there. 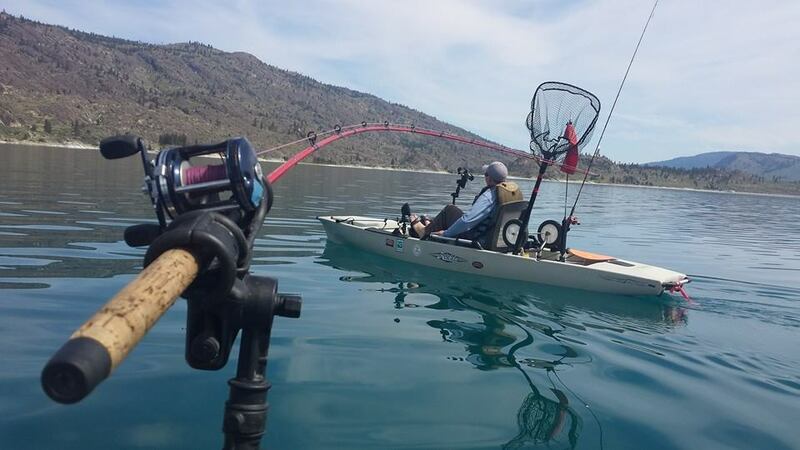 While many guys fly fish or cast spinners from either end of the lake via the shore, I enjoy exploring the lake by kayak trolling lead core line along the shoreline. 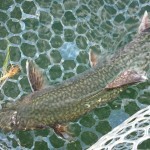 Springtime brings larger fish into shallower water to spawn. Needlefish spoons, Brad’s Cut plugs, Apex and even Rapalas work. Note that there is no bait allowed and gear is limited to a single, barbless hook. Fishing between October and May 31st is C&R but isn’t it more fun to take a photo and let them go. Put this one on your bucket list! We are expecting the 2015 salmon season to be very good. anchovy in a green haze teaser head. The West Coast of Vancouver Island is a wonderful area to visit and spend valued time for many people worldwide when on vacation. Known for its unique settings and rugged coastlines, Vancouver Islands west coast also better known as the Pacific Rim, not only offers world class salmon fishing but also offers other adventures and unique cultural activities. The whole of Vancouver Island is located only twenty miles off of British Columbia’s mainland. On this vast island there exists a majestic geographical area of tall coniferous forests and breath-taking scenic views of rugged terrain and coastlines that have been battered by winter storms. There is also a display of wonderful exquisite and secluded white sandy beaches located in areas of pristine and calm water. Those visiting Vancouver Island during the late spring and summer months must take in not only a “fishing adventure” but also explore the great rainforests, beaches, and lakes. 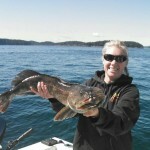 When fishing out in scenic Barkley Sound or offshore one can view wildlife and also whale watch. When on land and visiting the many local communities, visitors can seek out west coast culture, spa retreats, and of course take in some great west coast cuisine. 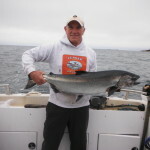 Vancouver Islands West Coast has had superb salmon fishing over the years. 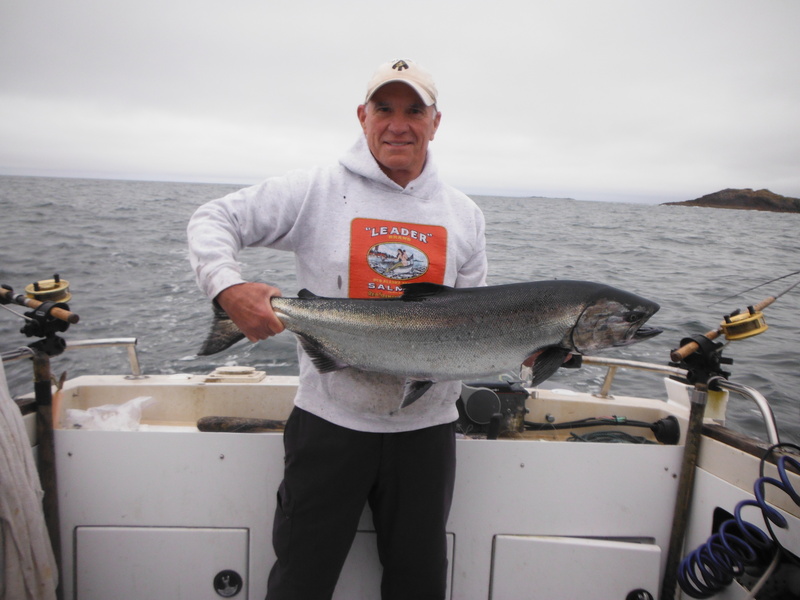 Salmon fishing in many of the so called “hot spots” has been nothing better than world class. The West Coast is also one of the only spots on Canada’s West Coast where one has the opportunity of hooking into a twenty pound salmon twelve months of the year. Of course every year is not entirely the same because predicted run sizes returning to many of the natal rivers, creeks and streams to West Vancouver Island are not as good as other years. 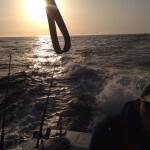 When fishing the Pacific Rim and many parts of Vancouver Island’s West Coast the opportunities for landing a Chinook or Coho salmon during the late spring or the summer months are very probable. In the Pacific Rim area we have the opportunity during these fair weather sport fishing months to target the vast quantities of migratory or transient salmon headed for the big watersheds to the south. 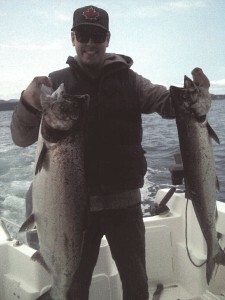 Bradley from Blaine Washington did very well fishing with a friend in the Alberni Inlet when fishing for Chinook. These fish were landed using coyote spoons and white and green hootchies. The 2015 sport salmon fishing season is expected to be “Very” good on the west coast surf line and offshore. Scenic Barkley Sound during the months of June and July and the early part of August should be fabulous. The expectation of high numbers of transient salmon headed to distant southern watersheds is already looking fantastic. 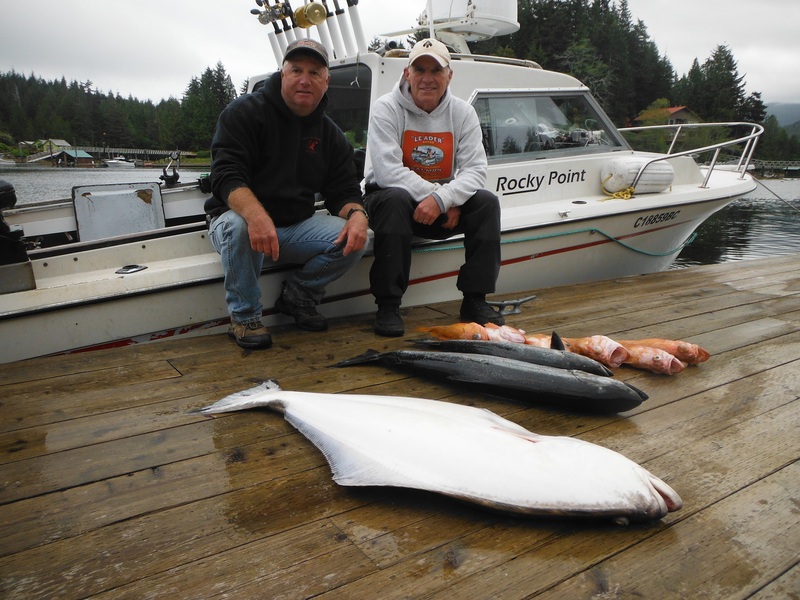 Salmon fishing around Ucluelet and a few areas of Barkley Sound has been successful for a few avid fishermen. A few Chinook salmon in the high teens and low twenties have been landed by guides and their guests and also sport anglers fishing in their private boats. Salmon fishing in Barkley Sound, along the surf line, and also offshore waters will continue from now through mid September or longer. There will be great opportunities to fish for Chinook and Coho in the waters of Barkley Sound during the months of May, June, and July. Coho salmon will become predominant in Barkley Sound in August and September with opportunity for Chinook in offshore waters. 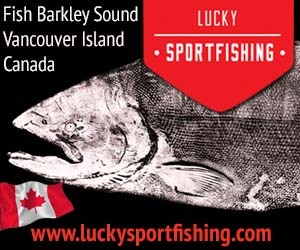 Look for another banner sport salmon fishing year on British Columbia’s West Coast —Vancouver Island. Bob of Oregon salmon fished with daughter Gerri and had a wonderful day of fishing along the Bamfield Wall. 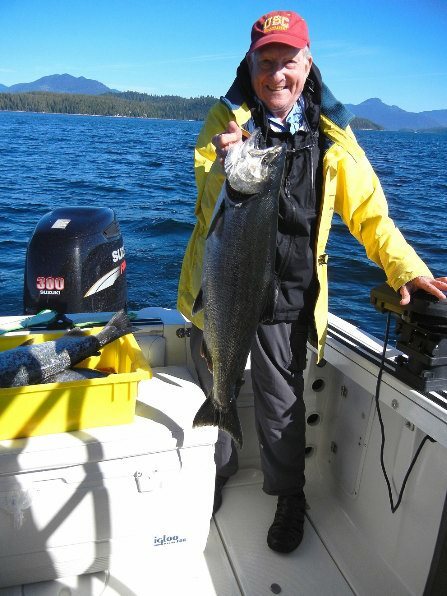 The Bamfield Wall and the Harbor Mouth have also produced some good salmon fishing. Some of the Chinook as of late have been clipped and the thought is that many of these Chinook are the early run of salmon migrating to rivers to the south. The salmon have been relatively deep from 85 to 150 feet. A variety of coyote spoons have been working. Green glow has been a favorite in the three and a half and four inch size as has the green and blue nickel. White spoons and white hootchies have also been on and off. Green glow, chartreuse, and purple glow hotspot flashers seem to be ideal when using spoons. Needle fish hootchies in army truck and mint tulip have also been working very well. 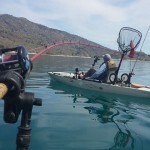 Fishermen trolling with anchovy have had their best success using a chartreuse Rhys Davis teaser head with a six foot tail behind either a Chartreuse or green glow hotspot flasher. There are a good number of undersize salmon so at times it is best to fish with spoons, needlefish and hootchies. We are expecting the fishing during June and July to be terrific. The mid- summer run of Chinook and Coho which are migrating to the big southerly watersheds historically begins in mid June and runs into mid July followed by the fall or “late run” with expected large numbers of these transient salmon headed to the Columbia, Sacramento, and Willamette systems to the south. Many of the salmon migrating down the Vancouver Island West Coast are forecasted to be four and five year olds which often means some good sized Chinook over thirty pounds. The surf line areas of Barkley Sound and out to offshore area at three to seven miles should have some great fishing as the rich resources of bait fish come into these areas which bring in the bigger Chinook. The month of April and May is often quiet in the Alberni Inlet except for those individuals fishing for prawns if and when the opportunity for this sport fishing is available. The Prawn fishing in the Alberni Inlet during the year when open has been very slow. Barkley Sound on the other hand has had some good areas for prawn fishing. 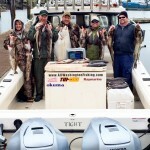 Guide boats in the early spring often include in their salmon fishing trips to Barkley Sound, prawn fishing. 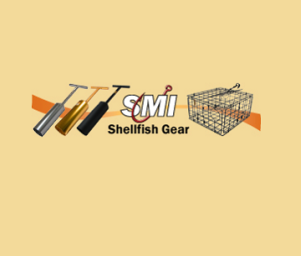 Usually the prawn traps are dropped before fishing and then after fishing the traps are picked up to find the great prize coming up from the ocean floor. Barkley Sound fishing has been fairly consistent over the last few months although one would have to sum up the fishing as being very mediocre. 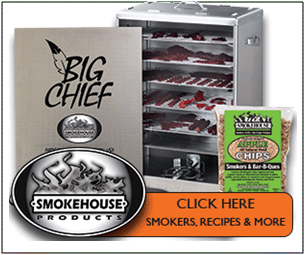 When fishing for feeder or winter Chinook the rule is often where one finds bait there will be Chinook salmon. Swale Rock, Vernon Bay, and Alan Point have all produced some nice salmon in the eleven to fifteen pound range. Austin and Cree Island have also had the odd salmon up to twenty pounds. The fishing for winter springs was SPOTTY this past weekend. Some hatchery springs into the teens were taken outside the harbour and near Secretary Island. However, the springs are scattered all the way west and past Sherringham Point. Bait is now out producing artificial when fishing for the springs. Anchovies are working the best and Green and Bloody Nose teaser heads being the best color choices. G-Force spoons in Irish Cream and No Bananas have been catching their fair number of fish. The most popular flashers recently have been the Gibbs Madi, the Outfitter and the Jellyfish UV. Halibut fishing was SLOW this past weekend. Salmon fishing was quite sporadic this week. Often the fishing was hot one day and then slow in the same area on the next. There were lots of good size fish around and we took our largest Chinook of the year, weighing in at 22 pounds. I’m still using needle fish hootchies fished near the bottom in most inside waters. Anchovy is always a great producer if you can’t get artificiasl to work. Mid channel from Bamfield to Cape Beale has been the hot spot close to home. Offshore, the lighthouse bank, south bank, 5 mile and big bank have all been producing Salmon and Halibut. 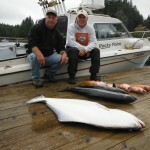 Myself and John with a nearly 50 pound Halibut and some nice Chinook. Halibut fishing has been really good close to Bamfield and also on the offshore banks. Fishing closer in has seen the larger fish with about a 40 pound average. The offshore Banks usually produce faster action and more Halibut of a smaller size. Bait fishing, lead jigs, or grub tails all have their times for action..
Chinook salmon fishing has been consistent the past couple weeks and most days we are getting our limits in the size range of 10-25 lbs. As usual the fish are moving around a little bit but challenging fisherman is okay, in fact we thrive on it. We are using the usual Coyote and Silver Horde spoons as well as glow cuddlefish hootchies. It seems many lures are working, it’s just a matter of getting in the right spot to find the fish. Most of the action this past week has been on Lighthouse bank, both inside and outside. The last couple days the bite has been better during the evening, though we are getting a nice size average in the morning. 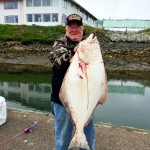 Halibut fishing has also been good and there are good numbers of halibut on the bank. There are lots of what we call ³paddles² and you will probably throw back a few of these in order to get the 15-40 lb size. Right on schedule the Gulf Islands have really heated up over the last few days! The eastern shoreline of Gabriola Island up to the Five Fingers seems to be the place to be. 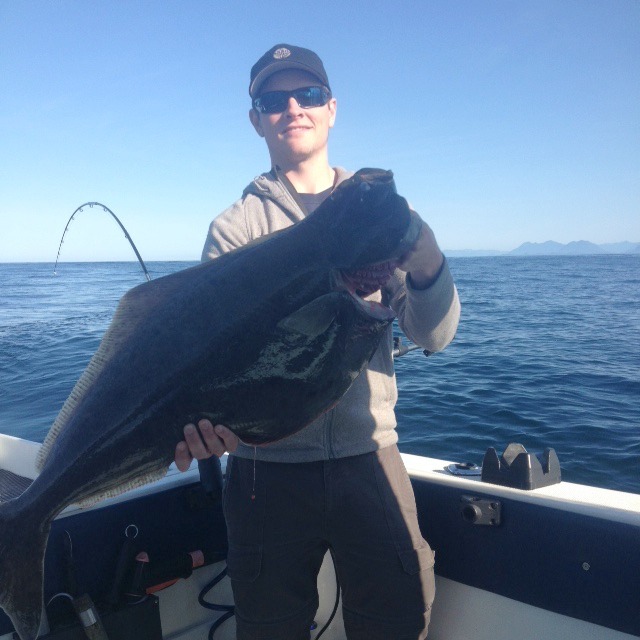 Our local trips have produced some fish as well off the Hump, Howe Sound and deep inside Vancouver Harbour. Sturgeon fishing has been surprisingly good as the Fraser River is staying in good shape as a result of the low snow pack this year. Early to mid-May is when we shift a lot of our attention over to the far side of Georgia Strait. This year is no exception and based on the last handful of days, the fish have arrived in good numbers. The offshore waters off Gabriola Island have been where the boats found the majority of our action. The fish have been fairly deep with most fish getting picked up from 120 to 200 feet down. As with any offshore salmon fishery, covering ground and dialing in the depth of where the fish are important for consistency. Over the next 6 weeks, the Gulf Islands will be where we will be spending most of our time. Locally, fishing has been ok. Some days boats are getting into a handful of salmon, and some days the boats are struggling for a couple of hook ups. Areas that have produced over the last week have been the Hump, QA marker, the Bell Buoy, the Freighters, and Howe Sound. 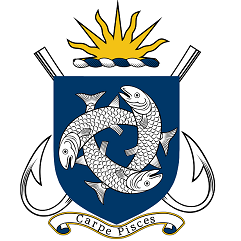 We should expect our local fishery to last for another couple weeks, before it gets pretty hit or miss for the month of June. Steve with a nice spring chinook. have had our best success on spoons and hootchies over on the Gulf Islands and anchovies and spoons on the Vancouver side. Our best producing spoons have been the G Force Trailhead and Bon Chovy as well the Silver Horde Irish Cream and Kitchen Sink. Our favourite hootchies have been the green and chartreuse glow splatterback made by Yamashita. We have had the best success on the Guide Series Lemon Lime, Madi, Bon Chovy and STS Flashers. Our Gibbs Delta Tackle Pro Shop is now open daily on Granville Island. Please come and see us for your local tackle needs and up to date reports! 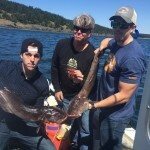 Becher Bay – Salmon fishing was SPOTTY in East Sooke. This past week, salmon were caught throughout the whole area and there was no one hot spot.. Most hatchery springs were running from 7 to 18 lbs in size and there were some larger unclipped fish that had to be released. Some of the salmon were caught deep (100 -140 feet) in even deeper water and others were caught from 50-70 feet on the downrigger. The fish were shallower around Beechey Head and deeper in the bay. The Bedfords were also productive for teenager springs. Anchovies were the most productive bait and Bloody Nose and Green Glow were the most popular teaser heads. Spoons and plastic baits have also been working well. Spoons such as G-Force in No Bananas or Glow/Green were effective. Squirts are working too with Pistachio, Purple Haze and Glow white the best patterns. For flashers, the Madi and the Purple Onion have been very good lately. 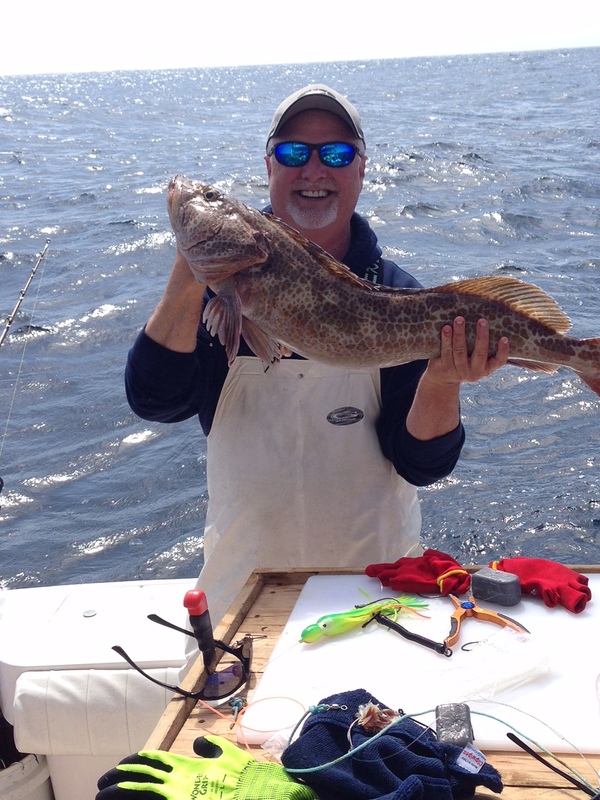 Not too many halibut were being caught this past week. 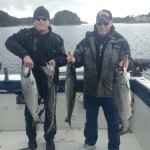 Oak Bay – Salmon fishing was good early in the week but SPOTTY just before and during the weekend. Hatchery springs as large as 22 lbs were caught early in the week but the fish were much smaller and scarcer by the weekend. Anglers were using squirts, spoons, or tiny strip or anything that imitated a needlefish. 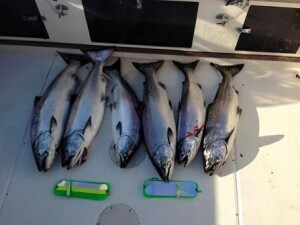 Many of the fish that were being caught trolling were caught on Coho Killer spoons and 3” to 4” G-Force & Gypsy spoons. Good squirts were the Purple Haze, J-79 and Electric Chair. Good flashers have been the Purple Onion, Green/silver or Green Jellyfish. 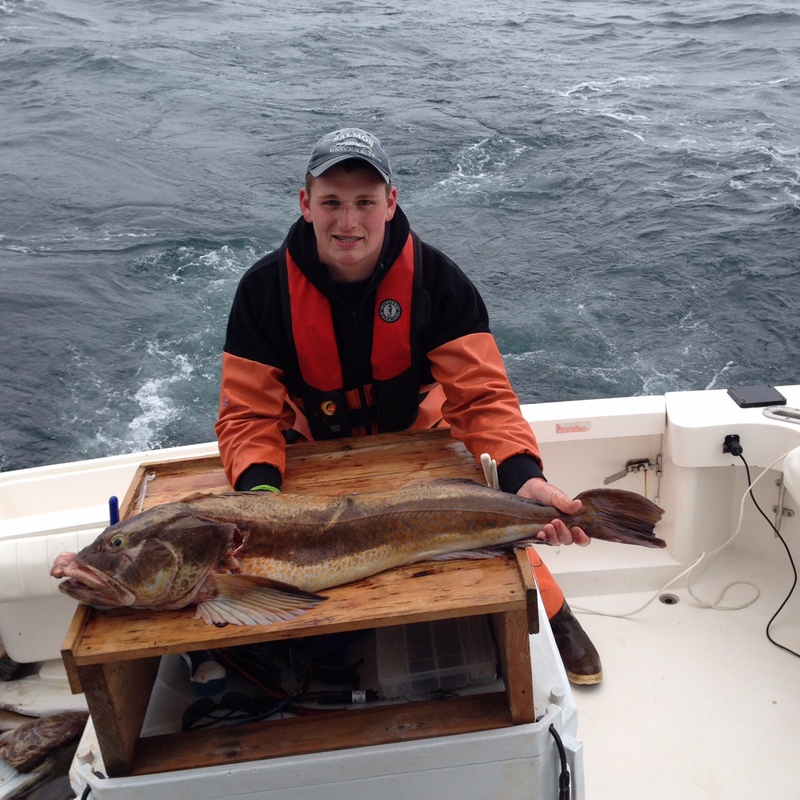 Halibut – Halibut fishing was SLOW this past week out in Haro Strait and off Discovery Island. Anglers are using mackerel, extra large herring, salmon bellies and/or octopus for bait. Berkley Gulp and Powerbait soft plastics also work very well. You can also use a large spoon fished off a spreader bar, Mudraker or Lucky Jigs or other large Jigs if you want to stay away from the dogfish. 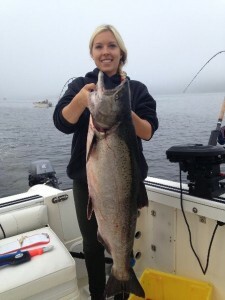 Pedder Bay – Chinook salmon fishing was FAIR to GOOD this past week. Whirl Bay was the most popular spot by far, but those fishing inside Pedder Bay by the can buoy were also picking up salmon. There were a couple of hatchery fish over 20 lbs caught in Whirl Bay but most of the hatchery fish were in the 7 – 15 lb size range. There were also reports of springs by the first tide line out in the Strait in 600 feet of water. They were hitting lures trolled at 120 to 150 feet on the downrigger there. Anchovy was the most productive lure for springs with Green Chrome, Purple Haze and Bloody Nose being top choices in teaser heads. Coho Killers and G-force spoons with both glow and green have been working the best. Flashers that remain popular include the Madi and the Purple Onion. 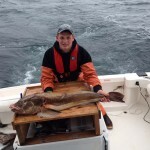 Halibut – Halibut fishing was SLOW this past week. Most anglers that were fishing were using mackerel, extra large herring, salmon bellies and/or octopus for bait. Berkley Gulp and Powerbait soft plastics also work very well. You can also use a large spoon fished off a spreader bar, Mudraker or Lucky Jigs or other large Jigs if you want to stay away from the dogfish. Cowichan Rive r- The water level has been steadily dropping for the fifth consecutive week. The water level today is 0.40-0 near the lake and .51 meters near Duncan. 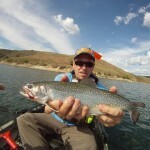 The trout fishing in the mid and upper river is EXCELLENT. Insect hatches are becoming larger and more frequent. There were some huge mayfly hatches this past week. The rainbows, cutthroats and resident brown trout are actively feeding on these hatches and migrating salmon fry. During the hatch, match the hatch with dry flies for exciting action. Bead head nymphs are the top producer when a hatch isn’t in progress. Good patterns are Prince Nymphs, Gold Ribbed Hare’s Ears and Wooly Buggers. A fry imitation or a Wooly Bugger will also work, especially for the brown trout. South Island, Bass – Bass fishing is PICKING UP. At this time of year most of the bass are in the shallows for spawning. During the day, soft plastics rigged Carolina style work well and crank baits can work well too. Soft plastics rigged “Carolina Style “is also a good choice when fishing drop offs and docks. The most productive colors in 4” Yum baits are Smoke or Pumpkinseed. Langford Lake, Shawnigan Lake, Prospect Lake and Elk and Beaver Lakes are the best local bass lakes. St. Mary’s Lake on Salt Spring Island is also a great lake for bass fishing. Bass fishing is now catch and release only until June 15th. 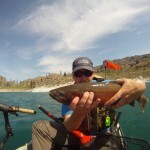 South Island, Trout – Trout fishing was GOOD on most lakes in the South Island area this past week. The Freshwater Fisheries Society of BC most recent local releases of rainbow trout from the Vancouver Island Trout Hatchery are as follows. 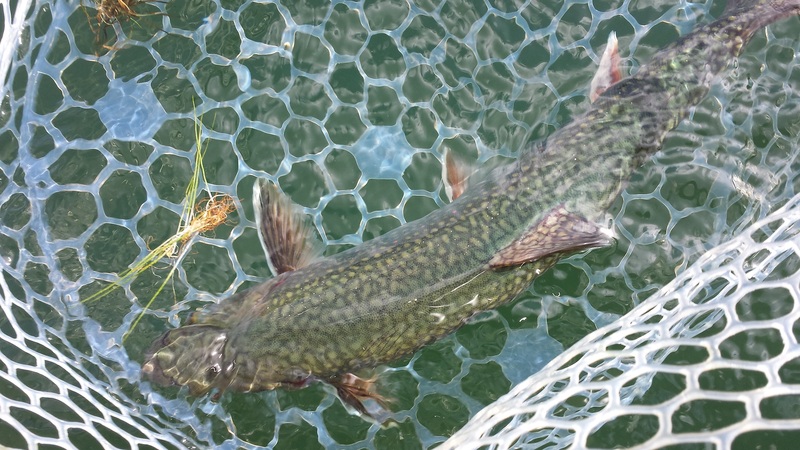 On May 11th, Elk Lake received 5,000 yearling trout with an average weight of 32.53 grams and Langford Lake received 2,500 yearling trout with an average weight of 64.46 grams. On April 24th, Elk Lake received 1,150 trout with an average weight of 214 grams and Durrance Lake received 650 trout with an average weight of 214 grams. 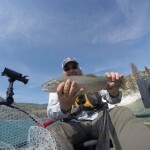 On April 22nd, Spectacle Lake received 500 trout with an average weight of 232 grams. On April 21st, Matheson Lake, Kemp Lake and Glen Lake received 500 trout with an average weight of 226 grams and Colwood Lake received 250 trout with an average weight of 226 grams. On April 8th, Elk Lake received 2,000 trout, Lookout Lake received 175 trout and Ida Anne Lake received 75 trout with an average weight of 208 grams. On March 13th, Shawnigan Lake received 2,164 trout averaging 248 grams. On March 12th, Spectacle Lake received 500 trout with an average size of 239 grams. On March 10th, Elk Lake received 1,850 trout, Lookout Lake received 200 trout and Ida Anne Lake received 50 trout with an average weight of 240 grams. On March 9th, Thetis Lake received 1,250 trout and Kemp, Matheson, Glen and Dougan Lakes each relieved 500 trout with an average size of 234 grams. 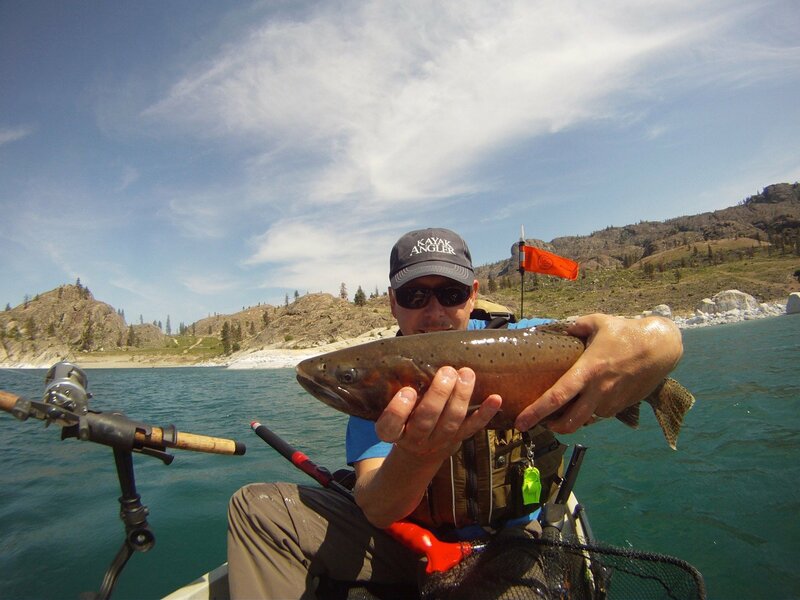 Stamp River – The winter Steelhead season is all but over. Many of the spawned out fish are heading back down the river and making their way out to the waters of the vast Pacific. The Fall of 2015 is once expected to be very good with plenty of early Coho and summer Steelhead in the mix. Those keen on fly fishing should look at booking trips from the 10th of October into the first ten days of November. Fishing for winter springs was FAIR off Constance Bank but SPOTTY along the waterfront. Hatchery fish weighing into the high teens were caught at Constance, as well as some bigger unclipped fish that had to be released. The salmon were feeding on needlefish that were schooled on the bank. Needlefish spoons were very effective in getting hook ups. Anglers have not done as well fishing closer to shore but there were a few fish near Brotchie Ledge.. Anchovies and Tony Strip have been working well in glow colors. Good choices in plastic baits are the Cloverleaf, Purple Haze and Glo Below squirts. Gibbs Coho Killer, Kingfisher and Coyote spoons in green and glow colours have been very effective. Tough But Steady Fishing Milwaukee! 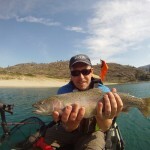 Harbor and gap fishing good to slow for Brown Trout with a few small Chinook. Small spoons or crank baits best bait in the harbor. Badger Tackle Reaper or Vulcan spoons getting it done in the regular size.